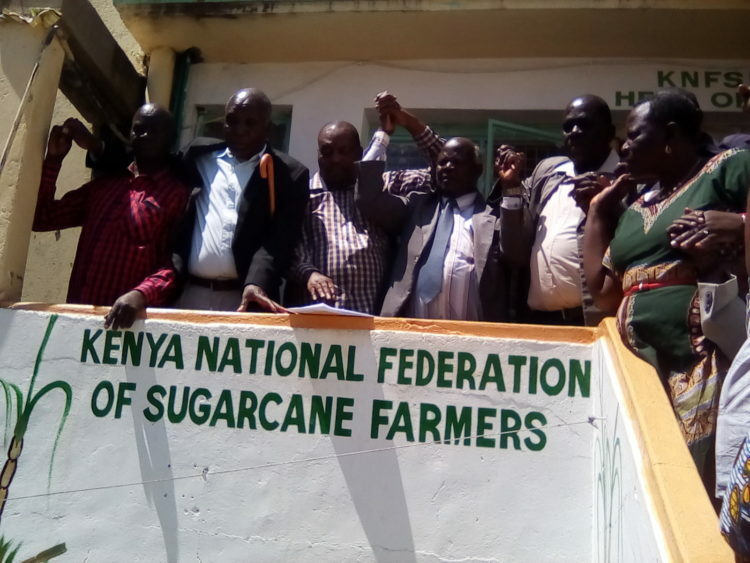 The Kenya National Federation of Sugarcane Farmers (KNFSF) has come out fighting against the newly formed Kenya National Alliance for sugarcane farmers (KNASF), blaming it for causing chaos in the sugar sector thus adding more problems to the farmers who are already suffering. Speaking to the press in Kakamega, the Deputy Secretary-General Mr. Simon Wesechere said the Saul Busolo led splinter body is illegal and being used by sugar cartels who would like to cripple the sugar sector. “The sugar industry has many sugar cartels that import sugar and would like to see the current situation in the sector persisting so that they can continue doing their fishy business at the expense of the farmers,” Wesechere said. He accused the former Director of the Kenya Sugar Board Mr. Saul Busolo of being used by the cartels to cause chaos in the sugar sector with an aim of frustrating the government’s efforts of reviving the sugar industry in Kenya so that the cartels can keep on importing illegal sugar adding that the only organization that speaks for the farmers is the KNFSF. “Busolo has been an MP and the chairman for the defunct Kenya Sugar Board (KSB), positions that he could have used to flex his muscles to help the farmers but he did nothing,” said Wasechere. Busolo’s lobby group is allegedly against the task force that was proposed by President Uhuru Kenyatta to look into the issues of sugarcane farmers claiming that farmers have not been represented. The board has further proposed that the sugar directorate be relocated to Kisumu given that most cane farmers come from the region and its outskirts. “You cannot expect a farmer who has not been supplied with fertilizer or has other issues to travel all the way to Nairobi to launch a complain, the office should be brought close to the farmers,” said Wesechere. Besides the head office, the board has also proposed for regional clusters where a number of mills will come together to serve farmers in the region without tying a farmer on a particular mill. According to Wesechere this will give farmers the freedom to choose the mill to work with. They also want the task force looking into the sugarcane issues to ensure that all cane factories pay the farmers within seven days after delivering their cane to avoid the backlog that has contributed to the debts being experienced now.